These divisions are based primarily on lithic technology and settlement patterns. While this focus tends to serve archaeological investigations, most of the prehistoric Indian habitation/occupation requires greater definition and appraisal from other sources within the archaeological community. Even among artifact collectors, there is a tendency to parcel these areas into the classic culture area concepts. This publication makes no attempts to refocus archaeology, but to show the vast overlaps of numerous point technologies. This is especially true over time; so that, for lithic point technology in general, there is a Panindian focus that can be applied to almost every tool type along the Atlantic Coast. This publication provides most of the published types from along the Atlantic seaboard. Each type has a basic description and the illustration is an ideal point for that type. 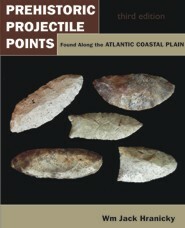 A set of point references is provided; these make excellent (and needed) sources for the study of projectile point studies. Jack Hranicky is a retired government contractor who has been involved with archaeology as a full-time passion for over 40 years. His main interest is the Paleo-Indian period, but he has worked in all facets of American archaeology. Mr. Hranicky taught anthropology at the Northern Virginia Community College and St Johns College, and has published over 200 papers and over 25 books about archaeology. He has served as president of the Archeological Society of Virginia (ASV) and Eastern States Archeological Federation (ESAF), been past chairman of the Alexandria Archaeology Commission, and he is a charter member of the Registry of Professional Archaeologists (RPA). He runs the Virginia Rockart Survey and the McCary Fluted Point Survey. Mr. Hranicky received the Lifetime Achievement Award from the Authentic Artifact Collectors Association (AACA) in 2010.